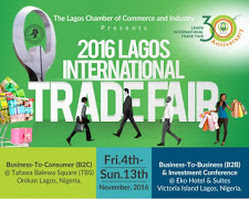 Lagos International Trade Fair | TMC | Toki Mabogunje & Co.
From November 3rd to November 14th 2016, the Lagos International Trade Fair will take place. It will be happening at Tafawa Balewa Square, Lagos, Nigeria. The Lagos International Trade Fair is the Biggest Trade Fair in Africa, and promises to be an excellent platform for both B2B, and B2C oriented organisations to explore new business opportunities.